One misty June afternoon in 2009, on a whim, Ria decided to take her first pottery class at Wesleyan Potters, an art and craft guild in Middletown, CT. The rest, as they say, is history. She is quickly becoming known for her distinctive style, recognizable for the exquisite original designs she drapes over the graceful curves of her wheel-thrown stoneware vessels. Refusing even to accept inspiration from outside sources, she bases all of her designs on doodles from her sketchbook. Despite the opulent appearance of her work, her focus is primarily utilitarian - every piece is designed with function and comfort of use in mind, and is food, dishwasher, microwave and oven safe. During the small fraction of her time in which she isn't completely slathered in clay, she enjoys subtropical gardening and playing video games, and has a particularly warm fondness for tea and fixing broken electronics and computers. But, if given the choice, Ria's entire bio would have instead gleefully read: "I play with mud and fire! :3"
I require a deposit of half the item's cost up-front, with the second half plus shipping due upon completion, at which time I'll send a photo of the finished work. Generally, turnaround time will be up to two weeks, but on rare occasions, due to significant life circumstances, it may take upwards of a month or two. In such cases in which date of shipping exceeds 45 days from date of payment, I will waive shipping. 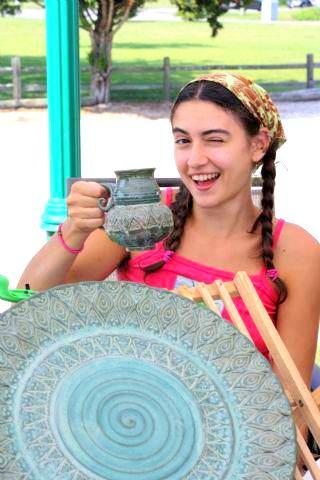 I will work tirelessly to craft your perfect item and am completely willing to remake it if it comes out of the kiln failing to conform to the agreed-upon specifications (I freely admit that the firing process can be unpredictable! :P). However, I do not offer immediate change of mind refunds on custom items once the photo has been sent and the item has been confirmed as adequate. If/when I am able to resell your custom item, the deposit or full price will be refunded. Undamaged work will be shipped back at the buyer's expense. Please note that I will not offer refunds on returns damaged in transit. I do not offer immediate refunds based on a shipping service's mistreatment of a package - I always purchase insurance and the proper channels must be followed for the refund to be processed (see below). I am not responsible for the post office's treatment of packages once they leave my hands, but I do my best as a seller by packing my work with care, sending priority mail, and purchasing insurance. In the event that an item arrives damaged, please contact me as soon as possible with a photo and make sure to keep every piece of packing material. You'll need to bring the box and all of its contents (including every last scrap of packing material and both damaged and undamaged pieces) to the post office in order for me to file a claim for you.